The magical marinade makes the well-loved Filipino tapa extra special. This version is served Mediterranean-style for added flair for your diners. Make a marinade by combining the Sprite, garlic, Knorr Beef Seasoning Powder, pepper, Knorr Rostip Chicken Seasoning Powder, fish sauce, and Knorr Lime Powder in a bowl. Marinate the beef for at least 3 hours. Saute the marinated beef in oil. Add the curry powder, cumin, smoked paprika, lemon juice, and lemon zest. 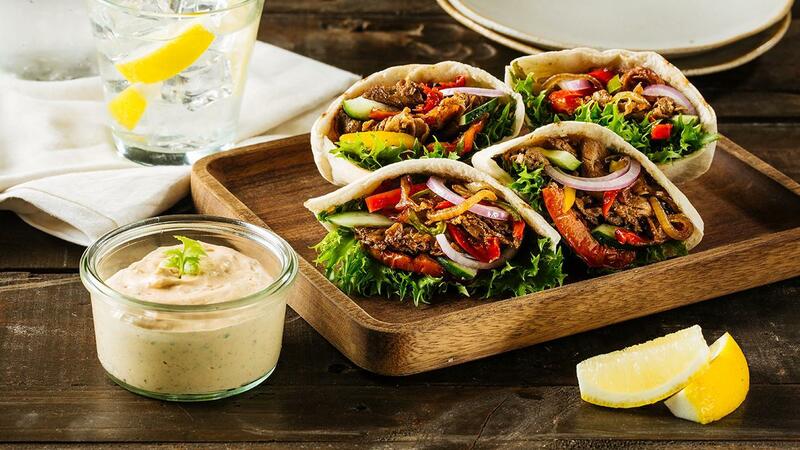 Fill each pita pocket with the salad greens, then the cooked beef, then the salsa. Drizzle with the prepared Peruvian dressing and sour cream.